Back row: N Cantwell, D Sadler, D Herd, B Foulkes, J Ryan, J Crompton (Trainer). Middle row: D Gaskell, S Brennan, B Charlton, J Aston, P Crerand, J Aston, P Crerand, A Stepney. 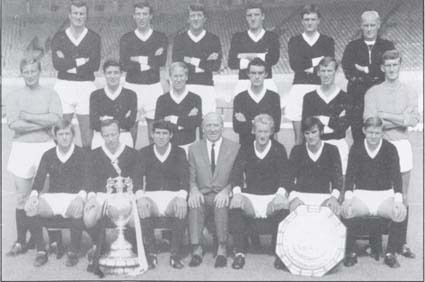 Front row: J Fitzpatrick, N Stiles, T Dunne, M Busby (Manager), D Law, G Best and B Noble.